Prepare the brownies according to the package instructions and allow them to cool. Prepare the pudding according tot he package instructions. 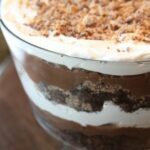 Crumble half of brownies into the bottom of a trifle bowl. Top with one crushed Heath Bar. Top with half of chocolate pudding, being sure to spread the pudding all the way to the edge of the bowl. Next, spread half of whipped topping over pudding. Repeat in same order with brownies, Heath Bar, pudding, and then whipped topping. Top with last crushed Heath Bar and refrigerate, preferably overnight, before serving.